Oh glorious fall days, you have been teasing us with your cool breezes and non-deadly temperatures this past week. Mornings have been a brisk 68 degrees in the days topping out at 87 degrees or so in the afternoon. 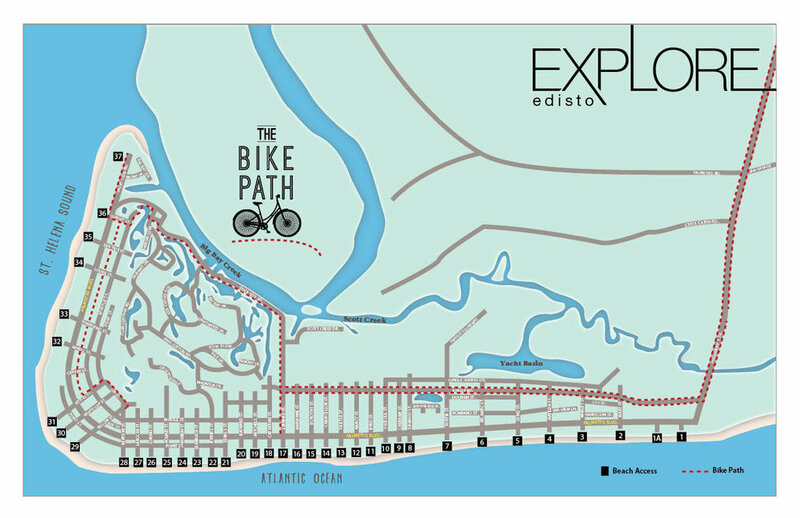 It’s the perfect temperature to dust off the bike and go explore the Edisto bike trails. If you didn’t bring your bike with you to Edisto, renting one is easy and inexpensive. Island Bikes and Outfitters or Edisto Essentials, both offer bike rentals by the day or week. Even if it has been years since you have been on a bike, Edisto offers a wide safe path to get back into the groove of things. We started out on our trek on the shaded portion that runs between Myrtle Street and Palmetto Blvd. Cars are not allowed on this part of the trail and it’s secluded, shaded and delightful. Edisto bike paths cover many miles and goes all the way up HWY 174 to Botany Bay. The Edisto Beach State Park also offers many bike trails through the maritime forest and offers various points of interest to stop and enjoy.. If you are enjoying a couple of days on Edisto I suggest checking the map and exploring a new path every day. Make sure to take your camera and share your photos from your bike trip with us on our Facebook page! Thank you for joining us and keep Exploring Edisto!